In my previous post about SP head-end cars, briefly describing my method of building inter-car diaphragms for these cars (you can read it at this link: http://modelingthesp.blogspot.com/2014/06/modeling-sp-passenger-cars-part-5.html ), I referred to a 1984 article I published in the magazine Prototype Modeler. I assumed that this would be accessible on TrainLife (www.trainlife.com ), but have now been told that the March-April issue for that year is not on the TrainLife site. I don’t know if that is temporary or permanent. Here is the cover of that issue, for those who may remember magazines this way (I know I often do). I have taken the liberty to scanning the article in my copy of the magazine, and putting it on Google Drive as a PDF. One advantage of this is that photographs will look better than most of the digital copies on TrainLife. Another, of course, is that you can archive, print or otherwise use the digital version as you like. This will enable access to the article for those who are interested in the entire piece. The prototype information in it is fragmentary, compared to resources we have today, particularly the volume on head-end cars, Volume 3, from the SPH&TS series, Southern Pacific Passenger Cars. Likewise, the modeling approach itself is obsolete, since better starting points exist, in particular the superb resin kits for these cars from Southern Car & Foundry. Their kit 1002 exactly models the 70-foot car I was attempting to create with the Athearn kitbash. Today we even have accurate SP Dark Olive Green paint for such cars. But the article may contain insights as to methods or approaches which will be of value. I have been gradually assembling various parts of the consist for my Southern Pacific Coast Line mail train, nos. 71 and 72. In Part 4 of this series (see: http://modelingthesp.blogspot.com/2014/06/modeling-sp-passenger-cars-part-4.html ), I described my modeling of express box cars. In that same post, I provided links to the three previous posts, which provide various items of background information. The modeling point I want to address in this post is diaphragms. For models, these have been available in generic form over the years, in many levels of detail and quality. Today, “generic” is no longer necessary, because there are beautiful kits of really fine diaphragms from Hi-Tech Details. You can see good photos of them at their site, http://www.hitechdetails.com/Hi-Tech-P_Car_Diaphragms.html . For that special passenger car, or any cars which may get switched into or out of passenger trains, or cars which run at the end of trains, where you want end details to be seen and appreciated, these would be superb. For head-end cars, though, many railroads, including SP, used a simpler design of diaphragm. Another common type has a flat top shape, but otherwise appears very much like the one above. This is shown on SP 6188, a Class 60-B-2 car at Oakland on April 13, 1951, taken again by Will Whittaker. The “fold” on the near side appears missing, not an uncommon sight. For these kinds of head-end diaphragm, I usually make my own, because it is fairly simple. Here’s how. The easiest way to use this drawing is to make a cardboard template of it, which can be traced onto the styrene for as many plates as you wish to make. When traced, these exact-size templates give a slightly oversize styrene part, which then is easy to size and profile with a small file to final shape and dimensions. 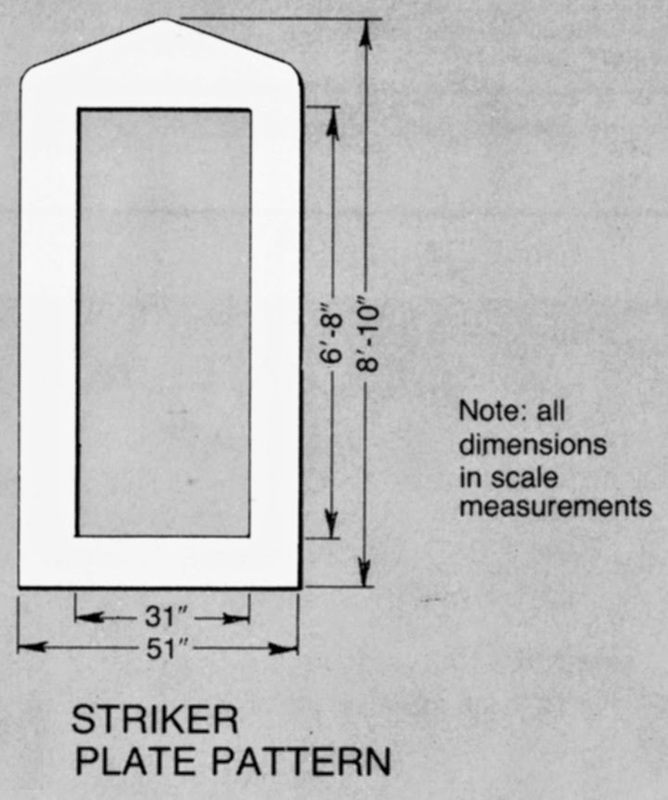 Then I make a single-fold piece (about 6 scale feet high) for each side, sometimes with 0.005-inch styrene sheet, sometimes with paper, and add a D-shaped folded strip of the 0.005 styrene, as shown below (also from the article). The parts are body color. When installed on the car, the striker plate can be painted body color if the car looks freshly painted. Otherwise, the plates of adjacent cars rub together continually and paint gets rubbed and scraped. Many cars in service show no paint at all on these plates. I have painted most of mine a dirty steel color, with rust streaks, and usually with little or no body color paint remaining. This car is my Athearn kitbash. It’s worth emphasizing that regular passenger cars on the SP, as on other railroads, had more complex and complete diaphragms, compared to these head-end versions, for the obvious reason that the public would be passing between the cars. For those cases, the Hi-Tech Details parts are superb. But in this post, only the head-end type is shown. My way of making these diaphragms is pretty easy to do. Moreover, this diaphragm, though simplified, does look like SP’s application. My opening post in this thread about the Mutual Oil Company explored its history, and the 1920s absorption of the Mutual tank car fleet into the car fleet of its purchaser, Continental Oil Company. 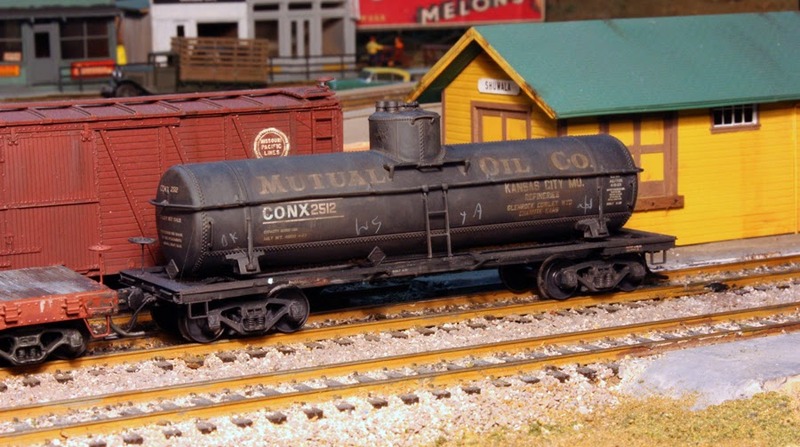 (You can read my post at: http://modelingthesp.blogspot.com/2014/06/the-mutual-oil-company-and-its-tank-cars.html ). I opened that post with a photo of an InterMountain tank car decorated for Mutual Oil. I confess to an impulse purchase of this model, and this is how the model looked, out of the box. I photographed it from a high angle to show the lettering to best advantage, but there is a side view in the previous post. The lettering below the company name on the right (shown in the previous post) identifies the headquarters of Mutual as located in Kansas City, Missouri, and lists the location of Mutual’s refineries, in Glenrock and Cowley, Wyoming, and Chanute, Kansas. I naturally wondered what I might be able to find out about Mutual, and whether or how I could use the car. That was the stimulus for the previous post, to understand Mutual’s history, and it was very clear that Mutual was absorbed by Continental in 1924, and the tank cars relettered over the following five years. But I model 1953, so what now? Obviously I needed to decide what to do with the model. I could see three options: to repaint the car entirely and reletter, since Mutual was long gone by 1953; to sell the model as-is, same reason; or to represent it as a “patched” car transferred from MOCX to CONX. I think it is unlikely, though perhaps possible, that the car would not have been entirely repainted by 1953. However, old tank cars often remained in service for many years without repainting, so I decided to choose that third option. My first step was to overspray the model with Dullcote, then weather in my usual way with acrylic washes, to make the entire car fairly dirty. (For a link to a joint clinic handout about this acrylic weathering method, you may go to: http://modelingthesp.blogspot.com/2011/10/weathering-clinic-handout.html .) I then painted out the reporting marks on sides and ends with black paint, and applied new reporting marks, CONX, in a slightly different lettering size and style. I used an old Champ alphabet set called “Modern Gothic.” All other lettering, including car number, was left alone. The intent was to suggest that Continental, upon acquisition of the Mutual cars, simply re-marked them without repainting the entire car. As I stated, this is not really likely, but perhaps just possible. Once this was done, I again applied a layer of weathering to the entire car, thus making the old paint even dirtier. In this regard, I take the point Richard Hendrickson often makes, on the basis of many prototype photographs, that it is difficult to over-weather an older tank car for any era prior to perhaps 1960. And the goal here was to make the original Mutual lettering all but unreadable, though this second weathering layer did not quite get to that point. Here the bold lettering is substantially dirtier and muted, compared to the “new” photo above, but is still more evident than I want. The CONX lettering looks about right here. Next I again applied a third overpainting of acrylics to dull the “Mutual” lettering further, added chalk marks and route cards, and produced this effect. This is pretty much what I wanted. What might the car have looked like if Continental had repainted it (which as I said was much the most likely outcome)? Here is the 1930s paint scheme, again from the InterMountain website, showing a newly-announced scheme on their 8000-gallon Type 27 car. So if you would prefer not to stretch probability as far as I have done, this is perhaps what would be better. The exercise of representing a car which was purchased and re-lettered only with reporting marks was interesting, as was learning some of the history of Continental. If you haven’t tried much research like this, I recommend it. You might find, as I do, that it can be fun as well as informative. A while back, I presented three posts relating to Southern Pacific passenger operations, as they could be operated on my layout. I began with some introductory material about the prototype Coast Line trains (at this link: http://modelingthesp.blogspot.com/2012/10/choosing-model-sp-passenger-cars.html ), and then went on to provide photos and a description of options for modeling the SP head-end cars I would need (you can find it here: http://modelingthesp.blogspot.com/2012/10/modeling-sp-passenger-cars-head-end-cars.html ), and concluded with a discussion about the various painting colors and decal lettering options for these models (it can be found at: http://modelingthesp.blogspot.com/2012/11/modeling-sp-passenger-cars-coast-mail.html ). Although I didn’t mention it in those preceding posts, there are a couple of kinds of head-end cars that really are only formally passenger cars. These are express box cars, and express refrigerator cars. Both can be found in photographs of the “Coast Mail,” as the primary mail train on the Coast Line was nicknamed, so I need to model them. The present post takes up the express box cars. For more information, you may wish to consult the Southern Pacific Historical & Technical Society Volume 3 in the series on Southern Pacific Passenger Cars, or their book on passenger painting and lettering. Both still available on their website. Volume 3, Head-end Cars, can be found at: http://www.sphtsstore.org/servlet/the-Books/Categories and the painting and lettering guide can be ordered at: http://www.sphtsstore.org/servlet/the-Books/s/17/Categories . The box cars are also covered, though not in as much detail, in Volume 4 on box cars, in my series Southern Pacific Freight Cars (Signature Press, 2006), now back in print as a revised edition (2014) with additions, corrections, and eight more pages. In the year I model, 1953, the Coast Mail train was still numbered 71 and 72, its only official name was Passenger, and it remained steam powered. It was common though not universal to see an express box car or two on the head end of the train. Broadly speaking, SP owned two groups of these cars. The best-known group is the 50 cars built as part of the order for the 1946 “Overnight” cars, Class B-50-24, in the famous black paint scheme. Of the 500 total cars built, 450 were those black cars, but the balance were equipped for passenger service and painted Dark Olive Green, like practically all other SP head-end cars of the time. There are some interesting details about these cars. 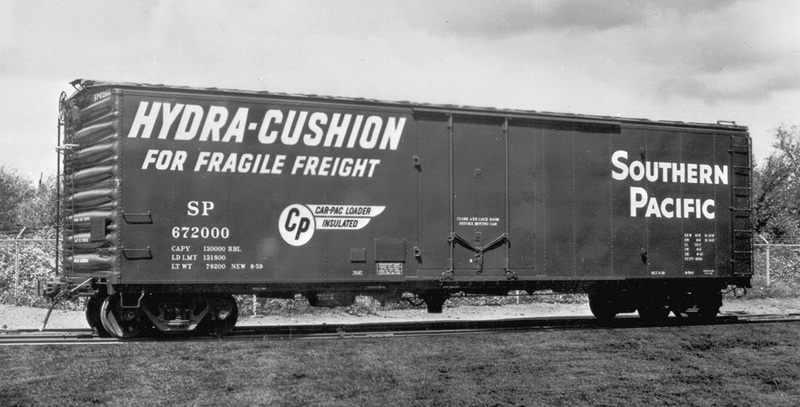 Delivered with ASF A-3 “Ride Control” trucks, in 1949–1950 20 of them were equipped with the Allied “Full Cushion” trucks which SP had purchased in 1940 for caboose service. But with other railroads refusing to accept cars with these trucks, the Allied trucks were removed by the end of 1950. Thirty of the cars still had the A-3 trucks, but the 20 which had had Allieds now got passenger-style General Steel Castings outside-equalizer trucks, cars no. 5700–5713 and 5735-5740. There was a fine Sunshine Models kit for these express cars, and Beaver Creek did the same cars in brass. 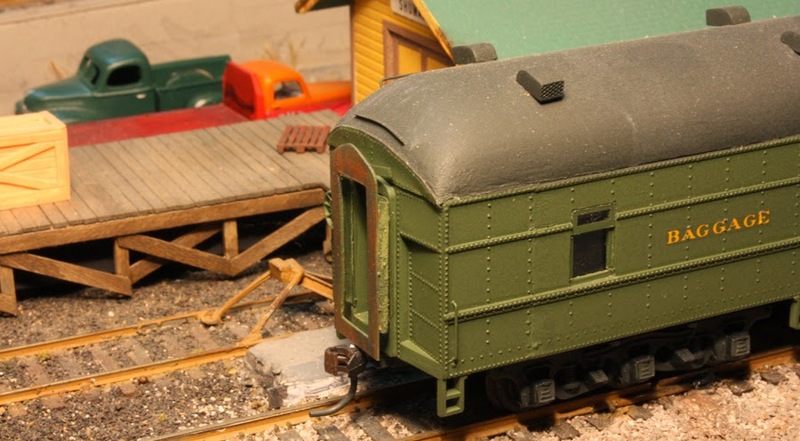 Beaver Creek supplied three kinds of trucks (see previous paragraph) and offered three different paint schemes, including the Dark Olive which I wanted. My Beaver Creek model is no. 5749, so it has A-3 trucks. Here is a photo of the car. I have been trying to get a kind of faded look, which shows up all right on the car sides, but the roof has come out dirtier, so probably I will experiment with additional weathering on car sides. The car is shown in the eastward mail train, No. 72, holding in Shumala siding behind a Pacific. There is a second group of express cars, gone or almost gone by 1949, for which I will require a modest time warp to operate occasionally in a 1953 train. These were the cars of classes B-50-15 and -16 which had been steel-sheathed for “Overnight” service prior to World War II, and about 100 of which received passenger-operation equipment such as steam and signal lines, and were repainted Dark Olive Green. 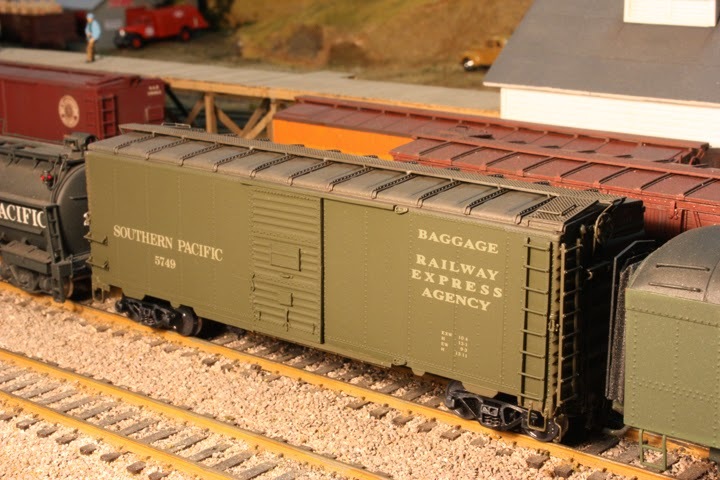 Sunshine Models offered numerous versions of the Class B-50-15 cars, including the express box car version, kit 38.25. I acquired one of the kits, Dennis Williams built it for me, and I applied decals and weathering. I suspect these cars were not often washed, if washed at all (unlike most SP passenger equipment in that day), because most photos show them pretty grimy. This photo shows my B-50-15 car in westward No. 71, passing Shumala depot. Here the train is powered by P-4 Pacific No. 2405. That concludes what I want to say about express box cars. I don’t intend to run them at the head end of my mail train on every outing, but occasionally they will offer a contrast to the rest of the consist. I have from time to time in my blog posts alluded to the California State Railroad Museum, or CSRM, located in Sacramento, and in particular to the excellent library which is part of CSRM. 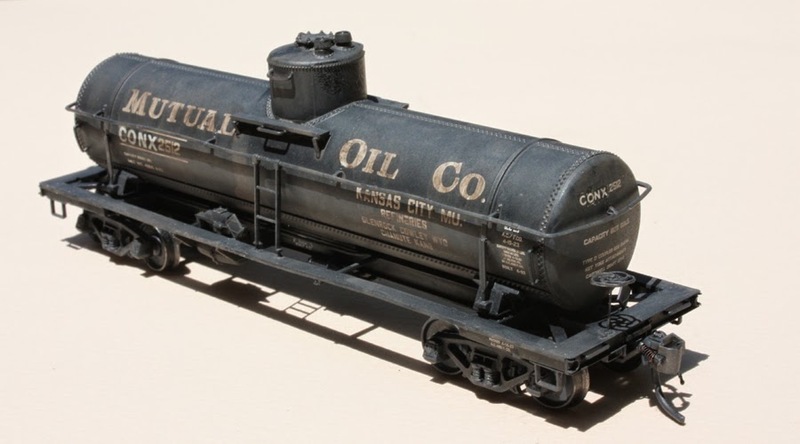 Most recently, I mentioned its resources in my blog about the Mutual Oil Company (you can read it at: http://modelingthesp.blogspot.com/2014/06/the-mutual-oil-company-and-its-tank-cars.html ). I am fortunate to live not terribly far from Sacramento, and perhaps equally important, I can easily travel there via train, specifically the Amtrak California service on the Capital Corridor route (of which more later). In this post, I want to offer a brief description about the library itself. CSRM is located in the historic area called Old Sacramento, and when you approach the main museum building at I Street (a couple of minutes’ walk from the Amtrak station), you see an imposing structure. Beyond it, at left near the flagpole, are some much older historic buildings. 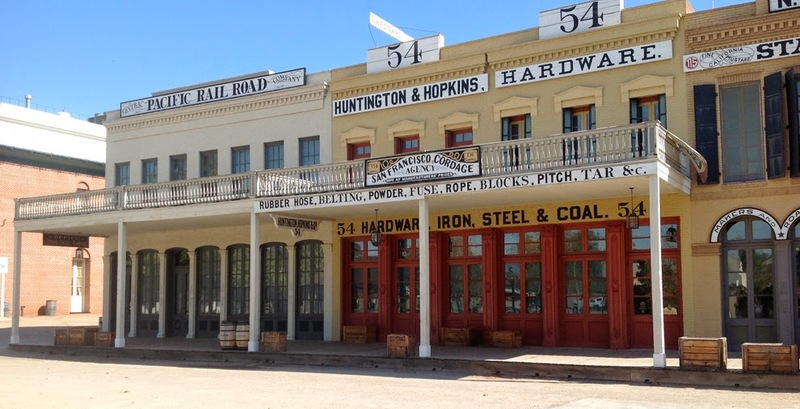 Those historic buildings (below) are actually the ones in which the origins of the Central Pacific Railroad were planned; the Huntington & Hopkins hardware store, restored to its historic lettering, clearly identifies the two members of the Big Four who were in business there. The CSRM library is housed on the second floor above the hardware store, the yellow building in the photo above, No. 54 I Street. The library is open to the public from 1 to 5 PM, Tuesday through Saturday, and when you enter at the top of the stairs, you first see, straight ahead of you, the collection of railroad books (this is only the reading-room part of the collection; there is much more in the basement, material which staff furnishes on request). 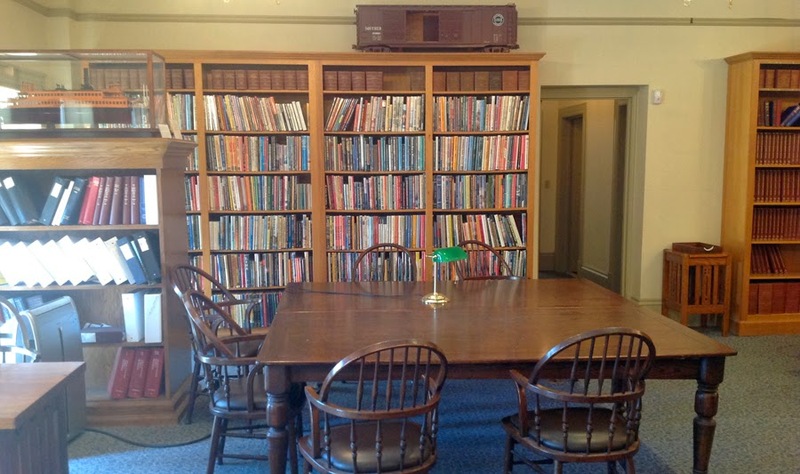 Incidentally, this is a research library, not a circulating library, and materials are used only in this reading room. For more about the library collections and how to use them, you can visit: http://www.csrmf.org/library-and-collections/using-the-library . Turning to the right slightly, you see a vast array of bound and unbound issues of the Official Railway Equipment Register or ORER. Shown here are the years 1918 to 1997. 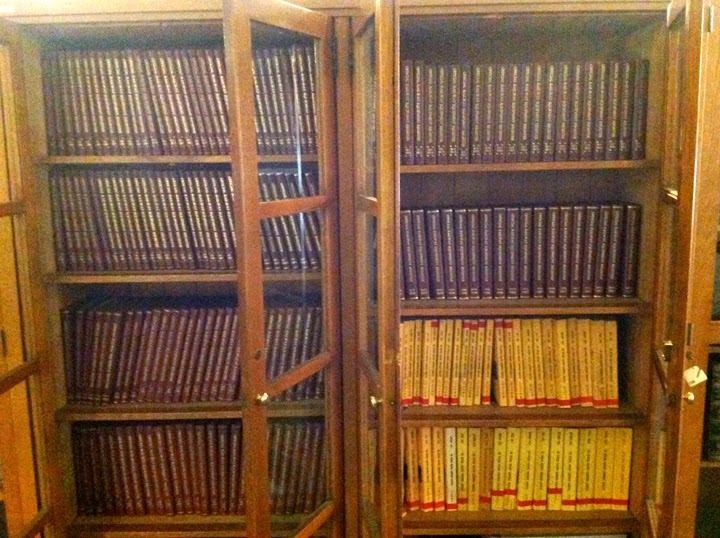 The many red bound volumes are the earlier years, the yellow ones lower down are the newer, unbound issues. At work in this photo is librarian Cara Randall. Anyone not familiar with the ORER might wish to read my introductory essay on this publication. It is in four parts, with the last part at this link ( http://modelingthesp.blogspot.com/2014/05/the-equipment-register-part-4.html ) and a link to the entire document is also available in that post, via Google Drive. 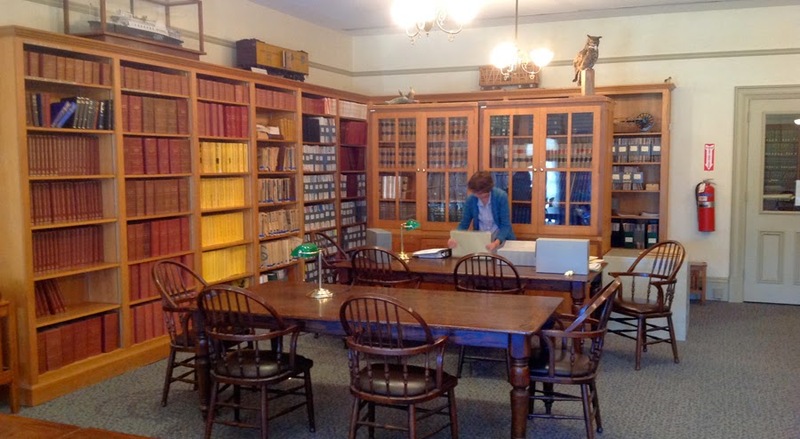 In an adjoining room, are more shelves, holding ORER issues from 1898 to 1917. There are a few missing issues out of all these years, but not many. It is a superb resource for the freight car researcher or historian. Here the normally locked doors of these cases have been opened for access. The newer yellow issues are spares. I cannot say enough about this library. In addition to the rather small fraction of the holdings shown in these photos, there is a massive amount of original railroad material, not just SP, in the collection, all available on request: photos, physical artifacts, drawings and maps, papers, and records of all kinds. To a researcher it is truly a gold mine. I can say that the core of my research findings about SP freight cars have been accomplished here. Of course, we shouldn’t leave the library without mentioning that downstairs and in the adjoining building is one of the best railroad museums in the world. Just one of its superb locomotives is this one, familiar to every SP fan as the last cab-forward, no. 4294, so large it’s hard to photograph indoors. So that’s a glimpse of the library at CSRM. 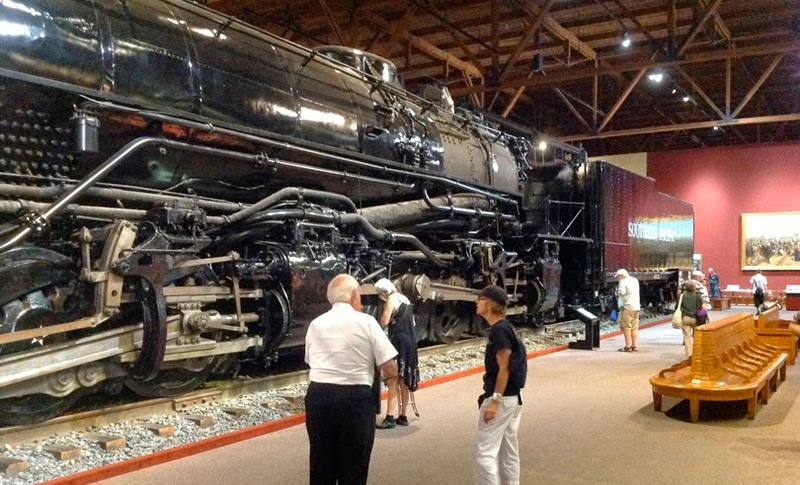 The museum is worth a visit for any railroad enthusiast, but the library is a special place if you are really interested in history from original sources. Awhile back, InterMountain released one of their AC&F Type 27 riveted 8000-gallon tank cars in an attractive, bold lettering for the Mutual Oil Company. Here is an image of the paint scheme, from the InterMountain website. As a person who may be already guilty of an overheated interest in the history of oil companies, as demonstrated in my research and writing on the history of the Associated Oil Company (you can read my discussion and conclusions at: http://modelingthesp.blogspot.com/2013/12/associated-oil-company-background.html ), it was hard to resist digging into Mutual, to see what I could find. I should emphasize that I don’t address this topic because of any intrinsic importance of the oil company, only as an illustration of what one may wish to do in pursuit of prototype information for freight cars. As it happens, one can find quite a bit on the Internet, no surprise these days. The beginnings of this company date to its incorporation in Maine on December 11, 1916 as Elk Basin Consolidated Petroleum, referring to the Elk River oil field in Wyoming. It was a successor to an earlier company called the Elk Basin Oil Company. They evidently did not do much refining or marketing originally, and accordingly acquired an Arizona company called Mutual Oil (Arizona) in April 1920. Arizona was probably the place of incorporation of this company, not its primary operating area, but it owned the three refineries you can see listed on the model in the above photo, and already was marketing to service stations. Elk River, however, had a much larger supply of crude oil for refining than did Mutual. Elk River also obtained the existing tank cars of the Mutual company in the purchase. The Elk Basin company then dissolved the Arizona company, and renamed the entire operation as Mutual Oil. This is all described in the Oil Trade Journal issue of April 1920, page 98. The next player to appear was the Continental Oil Company. Founded in Utah in 1875, they had been absorbed by Standard Oil in 1885, acting as the Rocky Mountain region component of Standard, and became independent again in the 1911 breakup of Standard Oil. In the 1920s, they continued to be active in marketing of petroleum products to the public, using a distinctive emblem of a Continental soldier on their filling stations, of which there were over 1000 in 15 states. In part because of a need for more crude oil supplies, Continental Oil Company acquired all the assets of Mutual Oil by merger, Jan. 28, 1924, including about 300 tank cars marked MOCX. Continental’s acquisition of Mutual Oil is described in Moody’s Industrials for any post-1924 year. But other sources suggest that in fact Continental had acquired the assets of Mutual as early as 1920, though continuing the operations under the Mutual name until 1924; see for example Helvering vs. Continental Oil, 68 F.2D 750 (D.C. Cir. 1933). The decision in that case is available on-line at this link: https://www.casetext.com/case/helvering-v-continental-oil-co#.U5kKMChQ0so . In any event, the history is that Mutual became part of Continental no later than 1924, and since Continental already owned some tank cars itself, apparently using the reporting marks CONX, the Mutual cars would have simply been absorbed into the CONX fleet. But exactly how and when did that happen? I was motivated to see what can be learned about the tank cars from the Official Railway Equipment Register or ORER, regarding both Mutual and Continental cars in service as such. I used the almost-continuous series of ORER issues archived at the library of the California State Railroad Museum for this research. But here one encounters a difficulty. 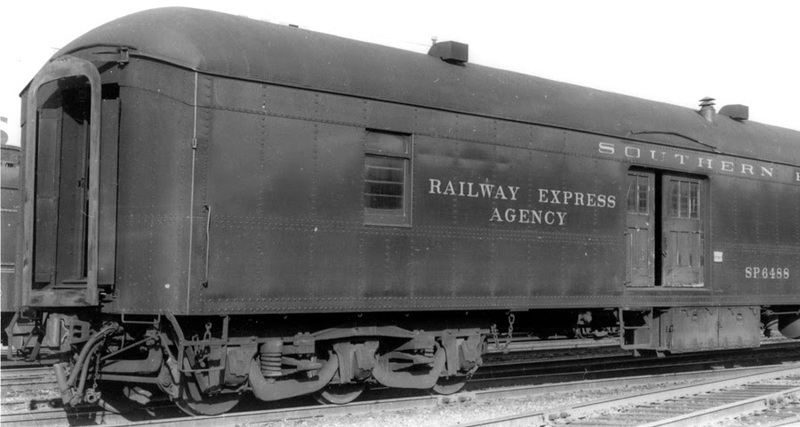 Although the American Railway Association of the 1920s requested all owners of freight cars to submit their rosters to the ORER (as printed on the title page of ORER issues), they were not required to do so, and many small owners of cars which were used entirely in company service did not do so. This included Continental and Mutual prior to their merger. But in the April, 1925 issue of the ORER, for the first time there is an entry for Continental Oil, and the entry is all about the absorption of the tank car fleets of several smaller oil companies: Mutual Oil (MOCX), along with the Kansas Co-operative Refining Company (KOX) and the Sapulpa [Oklahoma] Refining Company (SRFX) — none of these four had previously had ORER entries! That Continental entry was soon rearranged to show more information; I reproduce below the Continental entry for December 1926. From this entry, it looks like the car number series were retained for most or all of the absorbed cars. Over the succeeding years, the numbers of cars shown with non-CONX reporting marks shrinks steadily, and the KOX and SRFX marks disappear well before the MOCX listing does so within Continental’s entry. Finally, the June 1928 listing for Continental in the ORER is the first in which MOCX relettering is no longer mentioned. 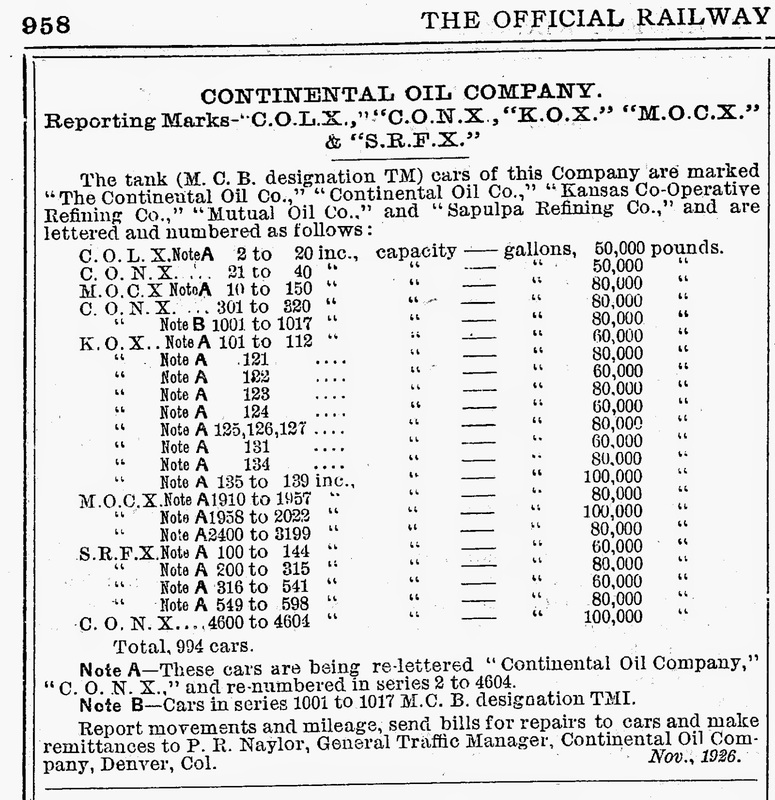 So over about four years, the MOCX cars were absorbed into Continental’s tank car fleet and received CONX reporting marks. All through the 1920s, the CONX fleet contained over 1000 cars. A striking change showed up in the Continental ORER entry for October 1929. Two more companies’ tank cars were being absorbed. One was the Prudential reporting mark, POLX, used for both Prudential Refining Corp. and Prudential Oil Corp., roughly 100 cars. The other one was Marland Refining Company, MARX, and thereby hangs another tale. In fact, in 1929 that other oil company took over Continental. The Marland Oil Company, founded in 1911, had grown tremendously, with thousands of filling stations in 30 states. But they needed more oil supplies, and purchased Continental on June 26, 1929. They then took the name Continental Oil Company for the combined operation, and moved the headquarters of Continental from Denver to Marland’s headquarters at Ponca City, Oklahoma. They also created a new marketing emblem, using the old Marland emblem of a red triangle, but replacing the words “Marland Oils” with “Continental.” Here is an example of a Marland station. This triangle logo would be used by Continental until 1970. The Marland tank car fleet in 1929 was nearly 1000 cars, so when in October 1929 there is the first ORER mention of relettering MARX cars as CONX, the combined Continental, Prudential and Marland fleets amounted to over 2100 cars, though they evidently discarded some of them pretty quickly, probably older cars, and within a year or two the combined fleet was down to 1700 cars. 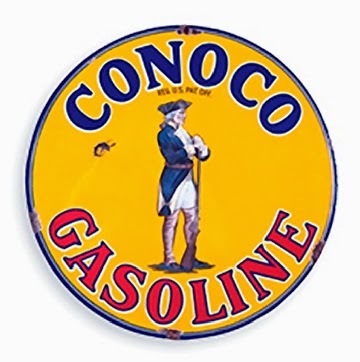 The CONX reporting mark continued for many years, though Continental Oil (now Conoco) was bought and sold several times. At least as late as a 1997 ORER issue I examined, they still had 565 tank cars with that mark. In my following post on this topic, I return to the model shown at the top of this post, and discuss what to do with it. In recent years, when I have presented talks or clinics about Pacific Fruit Express, I have often been asked the question, “How can I figure out what fruits or vegetables would be shipped from the area of my layout?” — or words to that effect. I have touched upon this topic, though not explored it in depth, in a previous blog; it is at: http://modelingthesp.blogspot.com/2011/08/few-words-on-packing-houses-and-produce.html . I showed there the resources available if you happen to model in Southern Pacific territory, as I do. But what if you model some area other than SP territory? As you would quickly find by using Google, there are phenomenal amounts of information and statistics out there, about agricultural production. For example, the U.S. Dept. of Agriculture has a National Agricultural Statistics Service (NASS) with current and historical data by county. You can visit their website at this link: http://www.nass.usda.gov/Charts_and_Maps/Crops_County/ . Another similar source (I am not trying to be exhaustive here, only suggesting some leads of this kind) is a set of crop data, under the name Find The Data, which can be searched on their web page; one of their pages is here: http://farm-crops-county.findthedata.org/ . There are also historical sources of other kinds. Many modelers are aware of the Sanborn fire insurance maps, available from the Library of Congress and from many local libraries and historical societies. These help identify facilities such as packing houses; the same is true of resources like historic telephone books, again something often archived in local and regional libraries. This will give you names of businesses and often their product(s). If you can visit the area you model (assuming it is not where you live), a local librarian in that area may also be able to help with information about agriculture and crops in the area. They often know of special resources of historical information about their area. Another possible source is box labels for fruit and vegetables. In recent years, these have become collectible and both books and websites exist with extensive coverage. In some cases, these labels are specific about the particular fruit or vegetable, as with this Arizona cantaloupe label image sent to me by a friend, or this California tomato label from my own collection. For any area, produce may have been grown for relatively short-travel markets, such as into a city from the surrounding region, or much longer travel, to faraway regions of the country. Obviously the latter is more likely to be carried by rail, but high volumes of even shorter-distance crops were carried by rail before the Interstate highways became a network of effective truck transportation. That was certainly the case in my own modeling year of 1953. So although I don’t think there is just one answer, or source of answers, to that question of what crops were shipped from your area, I do believe that a little digging will readily show that there is a lot of information out there. It all depends on how much you want to know. In fact, insulated box cars continue to be various RB subclasses. Here is a 1959 example, photographed by Pacific Car & Foundry at their plant in Renton, Washington; the car is an RBL class, SP’s first 70-ton box car (SP negative N-6346). You may click on the image to enlarge it. Doesn’t look much like a reefer, does it? This insulated-car idea goes way back in time, certainly to the 19th century, when such cars were often listed as “beer and ice” cars in Equipment Registers, referring to their common cargoes. The cars were insulated just like refrigerator cars, but without ice hatches on the roof. The earliest ones had sliding doors like box cars, but soon they were being built with hinged side doors, like other reefers. Here are a couple of examples. This Klausmann Brewing car, with a home point at Cairo, Illinois, dates from the 1890s and is even lettered as a beer and ice car. Note the non-standard ladder next to the sliding door. The photo is from the Kyle Wyatt collection. In later years, it became uncommon to identify the cargo by lettering on the outside of the car, in hopes of reducing pilferage. This kind of car continued to be built, though in small numbers and primarily for beer shipping. In use, beer shipments in these bunkerless cars were accomplished by loading kegs and barrels inside and adding a layer of “top ice,” shaved ice blown over the cargo. But most private car owners and leasing companies preferred to build the more versatile regular refrigerator car. The RB cars were not all for beer. Some shippers of food products also used bunkerless cars. An example is H.J. Heinz of Pittsburgh, which rostered both regular ice reefers and bunkerless cars. Here is an example of the latter, in a detail of a photo from the Al Westerfield collection. Though not common by the 1950s, these kinds of cars did still exist. Among the main owners at that time was Anheuser-Busch of St. Louis, brewers of Budweiser beer, whose Manufacturers Railway Company was a wholly owned captive switching service for the brewery, and whose St. Louis Refrigerator Car Company owned the RB cars for beer shipping. This 1948 Anheuser-Busch photo shows the new 1947 paint scheme on the white-sided cars, with an enlarged emblem and a maroon stripe along the bottom of the car side. Note the word “beer” is nowhere in evidence! Note how large is the company name to the right of the door. 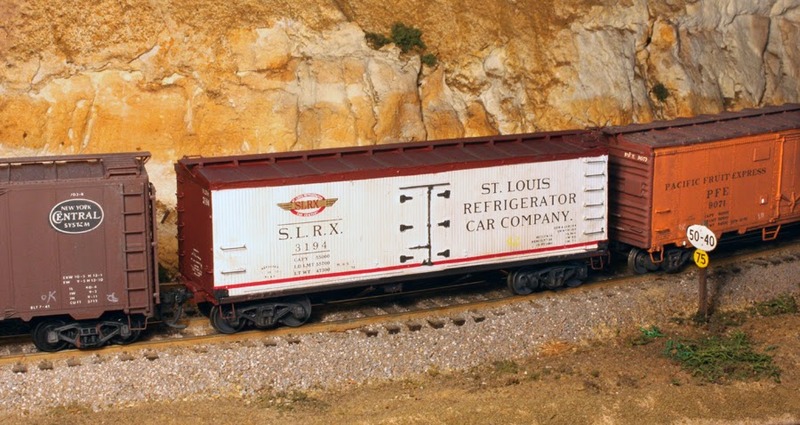 I’m sure the St. Louis Refrigerator people were tired of their reporting marks, SLRX, being confused with Swift meat cars, which had the mark SRLX. Just visible at right is SLRX 3359. The SLRX fleet was dominated by cars originally built during 1911–1913, either with truss rods or deep fishbelly center sills. Many of the cars were refurbished or rebuilt over the years, and in the early 1950s there were about 300 of the fishbelly center sill cars, while there were only about 100 of the truss-rod cars (with steel center sills added after 1930). I wanted to model one of the fishbelly cars, which were in the 3100–3300 number series. 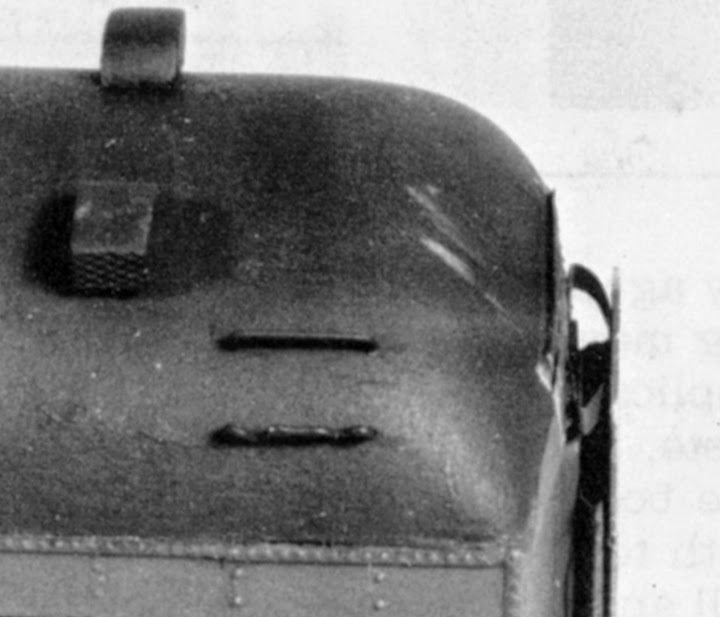 Many bunkerless cars, including the SLRX cars, were 36 or 37 feet long, and could be modeled from a meat reefer by building the deep center sills and omitting ice hatches. A better approach probably is a correct kit. Sunshine Models once offered a kit for the SLRX cars, kit 24.28, and I have one of these, built and painted by Denny Williams but with the complex decal application by me. Here is the unweathered car side, to show the lettering to best advantage. The absence of ice hatches on the roof is evident. Once fully weathered, the car was ready to go to work on my layout. Here it is shown passing in a through freight train. At right is a Southern Pacific speed sign. I’ve discussed the design and construction of these in a separate post. If you’re interested, you can read it at the following link: http://modelingthesp.blogspot.com/2014/03/speed-signs.html . I don’t have a beer distributor on my layout, so the car will be restricted to mainline use, but is a distinctive car for any train. From time to time around the country, local layout owners get together and organize an operating weekend, when invited or signed-up guests operate on the various layouts. These weekends range from fairly small numbers of people, to pretty large groups. Over May 29 to June 1, there was such an event in Southern California, called SoCal Ops. This group had hosted their initial event in 2012, so this was the second time around. I had attended in 2012 and greatly enjoyed myself, finding the layouts to be excellent and the event well organized and well run. So when I received information that it was about to be held again, I signed up at once. As before, there were some Bay Area car pools organized to drive down and back; I rode with the same group as in 2012, Mark Schutzer, Seth Neumann, and Sam Romerstein. Most of this group did the same layouts each day, simplifying transportation to and from the hotel in Simi Valley. On Thursday, we operated on Gary Siegel’s outstanding L&N layout in the Santa Barbara area. It has been well covered in the hobby press, so I won’t say more, but it is always a privilege just to see, let alone operate on, this beautifully scenicked and operationally interesting layout. We had a great time, the weather was perfect, and Gary provided a superb lunch. Hard to beat that. On Friday we operated on Jon Cure’s layout. It is freelanced, on the basis that the Southern Pacific standard-gauged the Carson & Colorado, creating a line from Mojave through Bishop, California, and on through Mina and Luning, Nevada, to a junction with the Overland Route, either westward to Reno or eastward via Battle Mountain. It is set in the 1980s, more or less, though some more modern equipment does show up. Jon’s layout is to me a magnificent creation, with perhaps only adequate (though complete) scenery but really outstanding complexity and challenge of operation. It has close to flawless track and electrical performance. 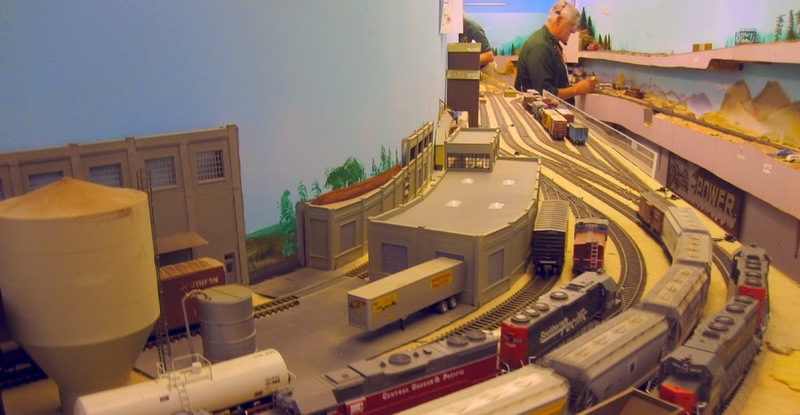 I love this layout, where I have operated a few times before, and once again, got a great operating job (the Hauler train) and had a great time. I will just show one photo. This is looking up the aisle across Bishop yard, toward Owenyo, where Jim Providenza is switching the Bishop Turn. In the past, I have run that Turn, and have also done the Bishop Yardmaster job, both excellent challenges. On Saturday, we went to Mark Lestico’s N scale layout in the Whittier area, modeling the UP’s Cascade Subdivision in essentially the present time. We were all pleasantly surprised at how well everything worked (this is not universal in N scale), and were particularly impressed with Mark’s scenery work. 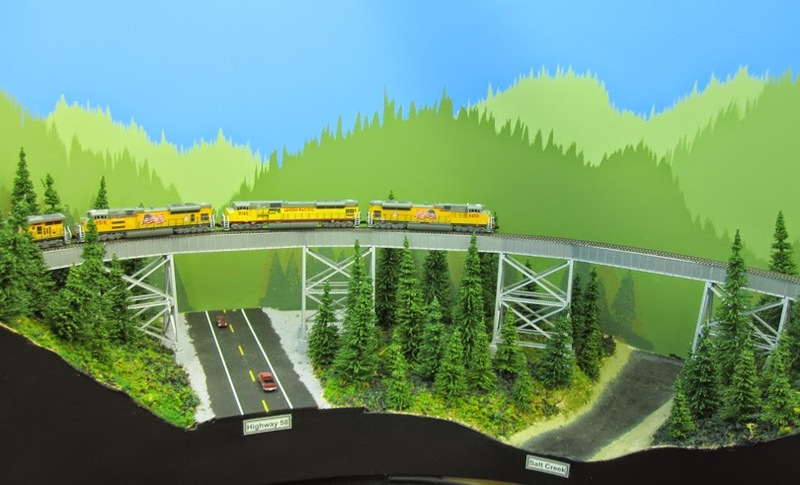 Here is his representation of Salt Creek trestle in Oregon, with Highway 58 passing beneath. The train on the trestle is the stack train I was operating. The simplified backdrop treatment was most effective, as was the black fascia. All trains were staged in a double-ended staging yard, called Portland/Roseville, representing the two extreme ends of the trackage. Here is a view of that yard on the right, with Eugene yard on the left. Ray deBlieck is studying his paperwork, with Jim Providenza behind him, bringing a train out of the Roseville end of the yard to begin a run over the railroad, and in the background is layout regular Ray Eiser. You can see the limited aisle size, the only thing I could even think of criticizing on this outstanding layout. Note the suggestion of downtown Portland on the backdrop at right. I admired many things on this layout, not least the very clear and helpful graphics on the fascia around the layout, showing you at each town what the various switching tracks were. 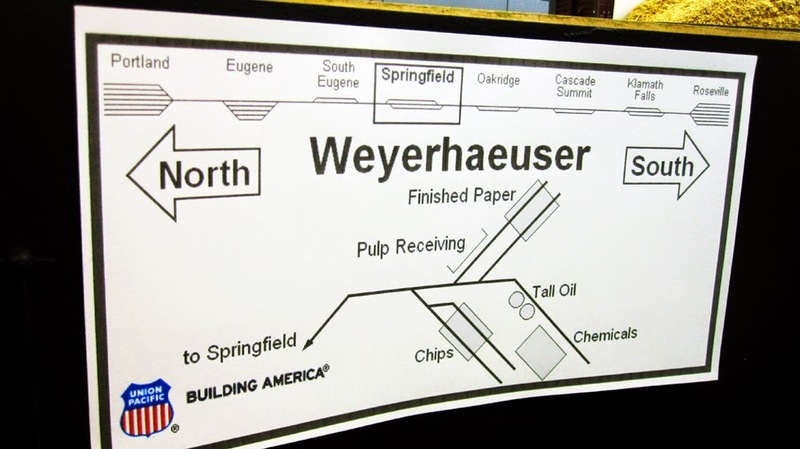 Here is the one at the big Weyerhaeuser lumber mill in Springfield, Oregon. Note the layout schematic across the top, to remind you of where you are, and the clear labeling of all tracks in the mill. On Sunday, we operated on Paul Catapano’s Atlantic Inland Railroad (pretty much channeling the Western Maryland), and I had a great job with intensive switching, the Littlerock Commercial job, and let me tell you, I moved a heck of a lot of cars out of and into all the industrial sidings. Great fun, and a good finish to a terrific weekend. Thanks to all the layout owners who hosted us, and to Al Daumann for once again organizing and running SoCal Ops. I’ve reflected in a prior post about the virtues of planning, and my thoughts as expressed then haven’t changed (you can read that post at this link: http://modelingthesp.blogspot.com/2013/10/planning.html ). But in the present post, I want to explore another aspect. As most of us have learned, general intentions to “make progress on everything” are all very well, but can and often do lead only to small advances on a number of different goals — or worse, getting distracted into a series of miscellaneous projects which don’t advance any particular goals, nor may they much advance broader goals of layout progress or other improvements. Of course, this may be a perfectly fine kind of hobby experience, where considerable enjoyment may attend all those miscellaneous projects. But if you do have actual goals, as many of us do, it may help to develop more focus. I know it helps for me. I learned long ago, whether in work or hobby time, or really just about anything, that one can easily keep quite busy with the daily details we all encounter. But looking back on a span of time so occupied, one may realize, as I have on occasion, that really not a lot had been accomplished, despite being “busy” the whole time. I once had a sign over my desk, “No Frittering,” which of course referred to frittering away of time, and hopefully meaning “no ‘busywork’ to the exclusion of bigger goals.” Of course, life requires us to do lots of small and sometimes boring things, and one’s hobby is not excluded from that — but my sign was an effort to remind myself that there should be effort devoted to bigger goals, too. I soon discovered, as probably most people do, that “signs over desks,” or any equivalent reminder, very quickly become part of the everyday scenery, and you no longer really see them. I once had the idea to hang such a reminder on a string from the ceiling, so it hung over the middle of the desk, and gently moved with air currents. This was certainly far more attention-getting at first, but once again, if you don’t comply with the reminder, it only works for so long. Then it too becomes part of the scenery. So how might one avoid “frittering” (besides reminders by your workbench)? One way is to have a plan. Of course it needs to be a realistic plan, and not too broad (I avoid items like “finish layout”). I like to break a plan into small steps so that I have frequent milestones, to give that sense of progress, and the small steps help me recognize how the work needs to be done, and perhaps rethink some of the step sequences. On place I’ve really seen a planning approach pay off for me, is when a deadline is in place. 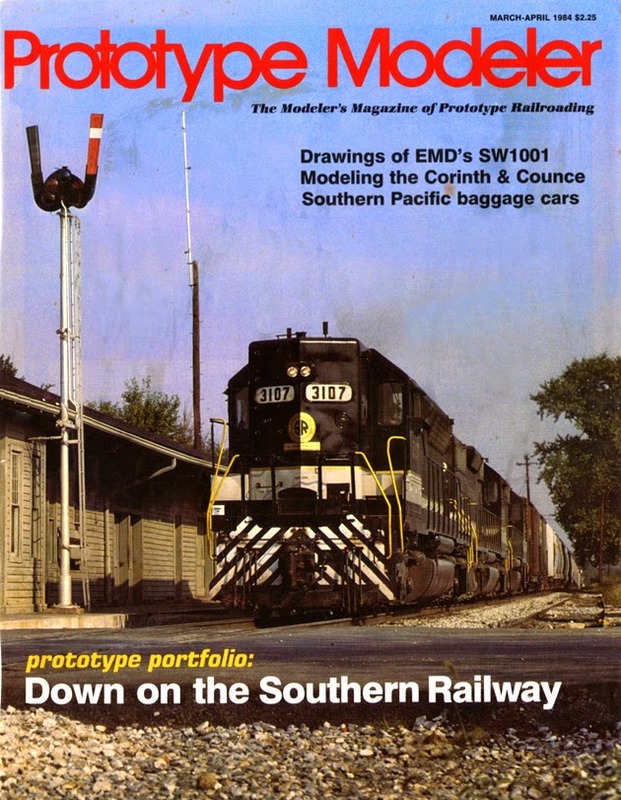 Maybe I’ve agreed to write an article by some date, or to give a talk that needs new material, or have my layout open for a layout tour (for example, see this post: http://modelingthesp.blogspot.com/2014/02/a-layout-open-house.html . Then energy gets focused on very specific things to finish (or sets of things), and much more distinct progress takes place. Now of course, some deadlines can really ruin your week (or month), when the amount of work gets overwhelming, so a sense of proportion is necessary in setting goals or agreeing to deadlines from others. When on the topic of deadlines, I’m always reminded of a cartoon a colleague had on his bulletin board. It showed a man on his knees, with hands together in prayer. He’s saying, “Lord, please save me from this self-imposed and totally unnecessary deadline.” And of course most of us discover that to be effective, deadlines usually have to be at least partly external, not entirely self-imposed. So when I agree to open my layout for a tour, or write an article, I do tend to welcome the deadline that’s created, because the deadline is sure to cause some focused work to be completed. But I also try not to set the bar too high (as in “finish layout”). That’s so I won’t be the guy in that cartoon.